A military plane has gone off the runway at Naval Air Station North Island into the San Diego Bay, officials confirmed Friday. A Navy pilot, flying in a T-45C aircraft, overshot the runway while landing during a training exercise at 2 p.m. (5 p.m. ET) a Navy spokesman said. The pilot was able to eject from the aircraft before it ran into the water. According to Harbor Police, a civilian boater pulled the crew member out of the water. After being evaluated at UC San Diego Medical Center, the pilot was released and is in stable condition, Navy officials said. When a pilot ejects from a plane, Lt. Reagan Lauritzen told NBC 7 that he or she must have more thorough medical evaluations than a standard checkup. According to Naval Air Forces, the pilot was training to undergo aircraft carrier landing qualifications before the crash. The T-45C plane, assigned to Training Squadron 9 in Mississippi, is a two-seat jet used specifically for Navy training. The $17 million aircraft is made by Boeing and BAE Systems, according to a Naval technology website. The incident happened off the Coronado base's runway 29, near downtown San Diego. For hours, the aircraft sat floating in shallow water against a sea wall. By Friday evening, crews stationed a crane on the shore and hooked lines underneath the submerged aircraft. They were able to hoist it onto land as night started to fall. While most of the plane appears intact, the canopy did fly off. The crash grabbed witness Sean Brady's attention when he heard a large boom. "So we came around the corner and looked outside and I saw a parachute landing in the water," he said. His first thoughts went to the pilot. "It was good to see the parachute, and you're just hoping he's OK," said Brady. The Naval Air Forces said a safety investigation has been launched to find out why the pilot went off the runway. In 2004, the base experienced a similar crash when an F-18 pilot was unable to stop the jet and rolled it past the airfield, into the bay. 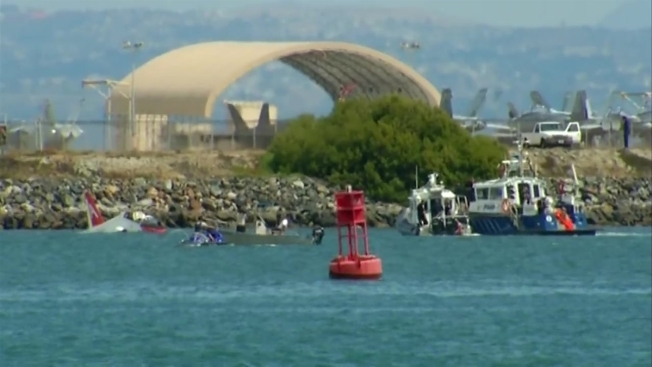 According to the U-T San Diego, the pilot was pulled from the water unhurt.